There is still a need for new alternatives in pharmacological therapy for neglected diseases, as the drugs available show high toxicity and parenteral administration. That is the case for the treatment of leishmaniasis, particularly to the cutaneous clinical form of the disease. In this study, we present the synthesis and biological screening of eight 4-phenyl-1,3-thiazol-2-amines assayed against Leishmania amazonensis. Herein we propose that these compounds are good starting points for the search of new antileishmanial drugs by demonstrating some of the structural aspects which could interfere with the observed activity, as well as suggesting potential macromolecular targets. The compounds were easily synthesized by the methodology of Hantzsch and Weber, had their purities determined by Gas Chromatography-Mass spectrometry and assayed against the promastigote forms of Leishmania amazonensis as well as against two white cell lines (L929 and THP-1) and the monkey’s kidney Vero cells. PrestoBlue® and MTT viability assays were the methodologies applied to measure the antileishmanial and cytotoxic activities, respectively. A molecular modeling target fishing study was performed aiming to propose potential macromolecular targets which could explain the observed biological behavior. Four out of the eight compounds tested exhibited important anti-promastigote activity associated with good selectivity indexes when considering Vero cells. For the most promising compound, compound 6, IC50 against promastigotes was 20.78 while SI was 5.69. Compounds 3 (IC50: 46.63 μM; SI: 26.11) and 4 (IC50: 53.12 μM; SI: 4.80) also presented important biological behavior. A target fishing study suggested that S-methyl-5-thioadenosine phosphorylase is a potential target to these compounds, which could be explored to enhance activity and decrease the potential toxic side effects. This study shows that 4-phenyl-1,3-thiazol-2-amines could be good scaffolds to the development of new antileishmanial agents. The S-methyl-5-thioadenosine phosphorylase could be one of the macromolecular targets involved in the action. Neglected diseases affect thousands of people, predominantly in developing countries . The available pharmacological therapies, however, are far from satisfactory, since the existing drugs exhibit a moderate efficacy associated with toxicity. This is the case of leishmaniasis, a tropical endemic disease caused by protozoa of the genus Leishmania . The most common leishmaniasis treatments frequently require parenteral administration and chronic therapeutic schemes, which result in high costs and low accessibility to the farthest endemic regions . For these reasons, the need for new alternatives to treat neglected diseases remains urgent. The 2-aminothiazole scaffold is present in the structure of antiviral , antifungal , antimicrobial , anti-cancerous , and anti-inflammatory compounds . Recent papers have reported different 2-aminothiazole derivatives as promising agents against kinetoplastids such as Trypanosoma cruzi, Trypanosoma brucei, Leishmania donovani, and Leishmania infantum [9–11]. Kaiser et al. screened a set of 400 drug-like compounds from the chemical library known as “Malaria Box”, made available by the Medicines for Malaria Venture initiative, for potential repurposing of these compounds as antikinetoplastids. Their findings showed that 2-aminothiazole derivatives might be potential hits to be explored against trypanosomatids, specifically against Trypanosomes . More recently, Papadopoulou et al. synthesized a small series of 5-nitro-2-aminothiazoles derivatives which presented better antitrypanosomal activity than the standard drug benznidazole. Antileishmanial activity was also observed in some of the derivatives; however, toxicity against L6 cells was also verified . The 2-aminothiazole ring has gained increasing attention as an antiprotozoal hit. Nevertheless, the 4-phenyl-1,3-thiazole-2-amine scaffold alone has never been explored by its biological potential, mainly regarding the antileishmanial activity. In this paper, we report the synthesis and biological screening of eight 4-phenyl-1,3-thiazol-2-amines assayed against L. amazonensis, a species of leishmania from the L. mexicana complex, which is responsible for the cutaneous form of the disease. The compounds were also explored as to assess their cytotoxicity, selectivity index, and potential macromolecular targets. The main objective of these studies was to understand whether 4-phenyl-1,3-thiazol-2-amines could be good starting points in the search for new antileishmanial drugs, as well as to assess the chemical aspects that could interfere with the activity. Potential macromolecular targets, which could explain the observed actions, were also investigated by target fishing approach. Eight different aromatic ketones were applied in accordance with their 4-phenyl ring substituent, considering their effect on the lipophilicity of the system (Table 1). The 4-phenyl-2-aminothiazoles were synthesized according to the methodology of Hantzsch and Weber , from their respective arylketones and thiourea (1:2), in the presence of iodine (4 equivalents), by heating the mixture for 4 h. At the end of the reaction, hot water was added to the raw mixture, which was cooled to room temperature and washed with three portions of ethyl ether (~ 10 mL each) to remove the residual iodine. The water phase was neutralized with a saturated solution of ammonium hydroxide and washed with distilled water to yield a solid isolated by filtration under reduced pressure. The pure 4-phenyl-1,3-thiazol-2-amines were obtained by crystallization from Ethanol:water (4:1) solution . All compounds were assayed against promastigotes of Leishmania amazonensis (MHOM/BR/1973/M2269). Promastigotes were grown in 199 media (Sigma, USA) supplemented with 10% (v/v) of fetal bovine serum, 1% penicillin (10,000 UI/mL)/streptomycin (10.0 mg/mL) (Sigma, USA). The parasites were collected at log phase, they were counted at the Neubauer chamber, their concentration was adjusted to 1 × 106 cell/mL, and their cells were seeded at a 96-wells plate. The 4-phenyl-2-aminothiazoles were added to the culture, considering concentrations ranging from 3.2 to 142 μM. Compounds were diluted in Dimethyl sulfoxide (DMSO) (25 mg/mL) and diluted in 199 media to generate a 1% DMSO starting solution of each test compound. Positive control with no compounds and DMSO control were considered at the assay. All plates were incubated at 25 °C for 48 h, and PrestoBlue® vital dye was added to the wells. Viability was accessed with PrestoBlue® (Invitrogen, ThermoFisher) according to the manufacturer’s instructions. The reagent was added in each well (10 μL) and plates incubated for 2 h. Then, plates were read on a microplate reader (PowerWave HT, Biotek) with excitation/emission 560/590 nm (nm). The relative fluorescence units were used to generate the quantitative results. All compounds were analyzed as duplicates, and the parameters to calculate IC50 were obtained by GraphPad Prism, version 5.0. IC50 values were determined by the Hill equation rearranged . The cytotoxicity was measured in L929 and THP1 cell lines using PrestoBlue®Cell Viability Reagent (Thermo Scientific, Invitrogen) as described by Lall et al. with modifications . First, cells were maintained in RPMI 1640 (Gibco) supplemented with 10% fetal bovine serum (FBS) and 1% antibiotics (100 U/mL penicillin, 100 μg/mL streptomycin). Cell cultures were grown and maintained at 37 °C in a humidified incubator with 5% CO2. Then, L929 cells were seeded in 96-wells flat microtiter plate at a concentration of 1 × 105cells/mL (100 μL/well). To THP-1 cells, cultures were differentiated into macrophages by adding 50 ng/mL 12-myristate 13-acetate phorbol (PMA) (Calbiochem, San Diego, USA) in RPMI-free FBS. After 24 h of culturing, the adhered cells were washed with PBS and RPMI with 10% FBS were added. Both cell lines were treated with 4-phenyl-2-aminothiazoles at concentrations ranging from 3.2 to 142 μM. The plates were incubated for 48 h and, thereafter, 20 μL/well PrestoBlue® was added. The plates were incubated for further 2 h and the fluorescence was read at bottom using 540–570 nm excitation and 580–610 nm emission. The average of the fluorescence values of the control wells (medium plus PrestoBlue®) was subtracted from the fluorescence value of the positive controls (cells, medium, and PrestoBlue®) and from each experimental well (cells, medium, compounds and PrestoBlue®). Cytotoxicity was also evaluated using Vero cells, a monkey kidney cell line obtained from the American Type Culture Collection (ATCC CCL-81; Manassas, VA). The cytotoxicity was determined by the 3-(4,5dimethylthiazol- 2-yl)-2,5-diphenyltetrazolium bromide (MTT) method according to a previously described procedure [16, 17]. In all cases, the CC50 was calculated as described as in the Antileishmanial assay Section. Selectivity indexes (SI) were calculated by dividing CC50 against each mammalian cell line by the IC50 against L. amazonensis (CC50/IC50). Regarding the studies of the structure-activity relationship, both the partition coefficient and the molar refractivity (CLogP and MR, respectively) were calculated with Marvin Sketch 6.2.2 software . Electronic parameters, such as punctual Mulliken charges and dipole moment values, were calculated to the minimum energy conformer obtained after geometry optimization processing at Gaussian 09 W software. Electrostatic potential charges (ChelpG) were calculated by the ab initio method HF/6-31 g* (Gaussian 09 W) and mapped on the Connolly surface of each molecule . PaDel-descriptor calculator was used to obtain the topological indexes . Only qualitative structure-activity relationship studies were performed, as well as only the linear correlation coefficients above 0.8 were taken into consideration. Target fishing studies were performed applying the Web-based Software Pharmmapper , considering the 3D-optimized structure of the 4-phenyl-1,3-thiazole-2-amines and the ChelpG charges as the input files. The best 300 results were analyzed based on their fit and z’score functions. The docking protocol was established after performing redocking studies with the crystallographic data retrieved from Protein Data Bank, entry code 1CG6 (resolution: 1.7 Å), using the Gold 5.4.1 software . This protocol was applied to the docking simulation with the test compounds, mainly to the 6 one, the best compound of the series. The binding site was defined by the centroid between Met196 and Asp220 and considering a region of 14 Å around this point. Ten runs with 10 solutions each were performed to generate a set of 100 complexes, which were examined by the incidence of a recurrent pose as well as by their Goldscore and Chemscore values. The compounds were synthesized and isolated as solids of good purity and yields. Structural characterization of these compounds was performed by 1H-/13C-Nuclear Magnetic Resonance (NMR) and Infrared spectra (IR). Gas Chromatography-Mass Spectrometry (GC-MS) analysis was performed to verify the purity, as well as, the structure of the analogues. All compounds presented purities varying from 98 to 100% and molecular ion values (m/z) and fragmentation patterns correspondent to what was expected for each molecule (Additional file 1). Compound 1 was obtained as a pale yellow powder (61%): 1H-NMR (300 MHz, [D6] DMSO, ppm): δ=7.00 (s, 1H, H5); 7.05 (s, 2H, NH2); 7.24 (t, 1H, J1 = 6 Hz, J2 = 9 Hz, H13); 7.35 (t, 2H, J1 = 6 Hz, J2 = 9 Hz, H9 and H11); 7.79 (d, 2H, J = 9 Hz, H8 and H12); 13C-NMR (75 MHz, [D6] DMSO, ppm): δ=101.94 (C5); 125.99 (C8, and C12); 127.62 (C9, C10 and C11); 128.91 (C4); 135.40 (C2); IR (KBr): 3436 (νassNH2); 3254 (νsimNH2); 3155 (νC-H aromatic); 1599 (νC=N), 715 (νC-S-C); GC (retention time, relative intensity in %): 14.10 (100); LRMS (EI, 70 eV) m/z calculated for C9H8N2S 176.23, found 176. Compound 2 was obtained as a pale yellow powder (72%): 1H-NMR (300 MHz, [D6] DMSO, ppm): δ=2.29 (s, 3H, CH3); 6.91 (s, 1H, H5); 7.01 (s, 2H, NH2); 7.16 (d, 2H, J = 6 Hz, H9a and H11); 7.67 (d, 2H, J = 9 Hz, H8 and H12); 13C-NMR (75 MHz, [D6] DMSO, ppm): δ=21.25 (C13); 101.01(C5); 125.93 (C7); 129.48 (C8 and C12); 132.76 (C9 and C11); 136.81 (C10); 150.36 (C4); 168.53 (C2); IR (KBr): 3454 (νassNH2); 3300 (νsimNH2); 3117 (νC-H aromatic); 2954 (νC-H CH3); 1537 (νC=N), 731 (νC-S-C); GC (retention time, relative intensity in %): 15,46 (100); LRMS (EI, 70 eV) m/z calculated for C10H10N2S 190.26, found 190. Compound 3 was obtained as a dark yellow powder (59%): 1H-NMR (300 MHz, [D6] DMSO, ppm): δ=1.18 (t, 3H, J1 = 9 Hz, J2 = 6 Hz, CH3 ethyl); 2.59 (q, 2H, J1 = 9 Hz, J2 = 6 Hz, CH2 ethyl); 6.91 (s, 1H, H5); 7.01 (s, 2H, NH2); 7.19 (d, 2H, J = 9 Hz, H9 and H11); 7.69 (d, 2H, J = 9 Hz, H8 and H12); 13C-NMR (75 MHz, [D6] DMSO, ppm): δ=15.97 (C14); 28.35 (C13); 101.06 (C5); 126.00 (C7); 128.27 (C9 and C11); 133.00 (C8 and C12); 143.17 (C10); 150.36 (C4); 168.54 (C2); IR (KBr): 3425 (νassNH2); 3265 (νsimNH2); 3116 (νC-H aromatic); 2958 (νC-H CH3); 2870 (νC-H CH2);1516 (νC=N); GC (retention time, relative intensity in %): 16,54 (100); LRMS (EI, 70 eV) MS m/z calculated for C11H12N2S 204.29, found 204. Compound 4 was obtained as a white powder (53%): 1H-NMR (300 MHz, [D6] DMSO, ppm): δ=7.14 (s, 2H, NH2); 7.22 (s, 1H, H5); 7.61 (d, 1H, J = 9 Hz, H12); 7.77 (d, 1H, J = 9 Hz, H11); 8.01 (d, 1H, J = 3 Hz, H8); 13C-NMR (75 MHz, [D6] DMSO, ppm): δ=104.27 (C5); 126.00 (C12); 127.60 (C7); 129.72 (C8); 131.17 (C11); 131.74 (C9 and C10); 135.88 (C4); 147.65 (C2); IR (KBr): 3446 (νassNH2); 3282 (νsimNH2); 3124 (νC-H aromatic); 1527 (νC=N); 1022 and 1041(νC-Cl); GC (retention time, relative intensity in %): 18,96 (97,8); LRMS (EI, 70 eV) MS m/z calculated for C9H6Cl2N2S 245.13, found 244. Compound 5 was obtained as a pale yellow powder (18%): 1H-NMR (300 MHz, [D6] DMSO, ppm): δ=7.18 (s, 1H, NH2); 7.26 (S, 1H, H5); 7.73 (d, 2H, J = 9 Hz, H8 and H12); 8.00 (d, 2H, J = 9 Hz, H9 and H 11); 13C-NMR (75 MHz, [D6] DMSO, ppm): δ=104.84 (C5); 125.89 (C9and C11); 126.46 (C8 and C12); 127.45 (C10); 127.98 (C7); 138.95 (C13); 151.47 (C4); 168.96 (C2); IR (KBr): 3479 (νassNH2); 3298 (νsimNH2); 3143 (νC-H aromatic); 1537 (νC=N); 754 (νC-F); GC (retention time, relative intensity in %): 14,13 (100); LRMS (EI, 70 eV) MS m/z calculated for C10H7F3N2S 244.24, found 244. Compound 6 was obtained as a pale yellow powder (27%): mp: 227-230 °C; 1H-NMR (300 MHz, [D6] DMSO, ppm): δ=1.29 (s, 9H, H14, H15and H16); 6.91 (s, 1H, H5); 7.02 (s, 2H, NH2); 7.37 (d, 2H, J = 9 Hz, H8 and H12); 7.70 (d, 2H, J = 9 Hz, H9 and H11). Melting point: Experimental (227-230 °C); Reference (228-230 °C). 13C-NMR, IR and GC-MS acquisitions not performed. Compound 7 was obtained as a pale yellow powder (47%): 1H-NMR (300 MHz, [D6] DMSO, ppm): δ=6.74–6.69 (m, 3H, H5, H8and H12); 6.92 (s, 2H, NH2); 7.60–7.55 (m, 2H, H9 and H11); 9.42 (s, 1H, H13); 13C-NMR (75 MHz, [D6] DMSO, ppm): δ=98.87 (C5); 115.60 (C9 and C11); 127.35 (C7); 150.57 (C8 and C12); 157.19 (C10); 168.41 (C4); 206.96 (C2); IR (KBr): 3487 (νassNH2); 3377 (νsimNH2); 3126 (νC-H aromatic); 2984 (νO-H); 1535 (νC=N); GC (retention time, relative intensity in %): 17,69 (100); LRMS (EI, 70 eV) MS m/z calculated for C9H8N2OS 192.24, found 192. Compound 8 was obtained as a white powder (67%): 1H-NMR (300 MHz, [D6] DMSO, ppm): δ=7.07 (s, 1H, H5); 7.08 (s, 2H, NH2); 7.39–7.44 (m, 2H, H8 and H9); 7.83–7.79 (m, 2H, H9 and H11); 13C-NMR (75 MHz, [D6] DMSO, ppm): δ=102.77 (C5); 127.69 (C7); 128.93 (C9 and C11); 131.98 (C8 and C12); 134.23 (C10); 143.05 (C4); 168.81 (C2); IR (KBr): 3437 (νassNH2); 3282 (νsimNH2); 3109 (νC-H aromatic); 1533 (νC=N); 826 (νC-Cl); GC (retention time, relative intensity in %): 16,50 (99,6); LRMS (EI, 70 eV) MS m/z calculated for C9H7ClN2S 210.68, found 210. All compounds were tested against L. amazonensis promastigotes. The cytotoxicity was also assessed against L929 and THP-1 by using the PrestoBlue® cell viability reagent, as well as against Vero cell lines by using the MTT viability assay. The results are presented in Table 2. Structure-activity relationship analyses revealed a good parabolic correlation between CLogP and antileishmanial activity (Additional file 2A), with a correlation coefficient of 0.968. The same behavior was also observed when regarding the Molar Refractivity (MR) values of the compounds, a parameter which also describes molecular hydrophobicity associated to molecular volume (Additional file 2B). No significant correlation (r2 = > 0.8) was found between activity and electronic parameters, such as electrostatic potential charges, punctual charges or dipole moments (see Additional file 3 to verify the parameters and Additional file 4 for electrostatic potential maps). However, some relationships could be observed regarding the Electrostatic Potential Maps. Compounds 3 and 6, for instance, showed a green left-side region (Additional file 4) whereas compounds 4 and 5, which presented an intermediary activity, exhibited a yellowish left-side region similarly to the one observed with compound 7, an inactive analogue. These findings could reveal some potential influence of the electronic distribution on the activity, although further studies must be performed to confirm these relationships. As the cytotoxic effects on Vero cells were substantially different from those obtained against L. amazonensis, L-929 and THP-1 cells, a target fishing study was proposed to suggest potential targets and, consequently, mechanisms which could explain these observations. The web-based software Pharmmapper was applied to search pharmacophore databases, such as the Target Bank, Drug Bank, Binding DB, and Potential Drug Target Database. Such software also takes advantage of a normalized score function, the z’score, to present the most probable targets to compounds with defined chemical structures . The energetically optimized structure of each compound, considering their ChelpG charges, was employed as input, and the best 300 targets – human and non-human – were retrieved. Table 3 lists the five best targets common to these compounds, along with the maximum z’score values that were obtained. The human S-Methyl-5-thioadenosine phosphorylase was elected as the best potential target, based in two criteria: the best Max z’score values found to each compound under analysis combined to the fact that this target was returned to all compound submitted to the target fishing. A BLAST (Basic Local Alignment Search Tool, National Center for Biotechnology Information) search was, then, performed to find homologous proteins in the L. amazonensis available proteome . The best nine results are listed in Table 4, together with the statistical analyses which corroborate their significance. Identity values above 35% were observed for the Leishmania species enzymes, so a docking study considering the human enzyme was also performed to elucidate the potential binding mode of the compounds into the catalytic site. The results are illustrated in Fig. 1. The compounds were obtained as expected with good yields and purities. The fact of the easy synthetic preparation constitutes one of the major advantages for the future application of these analogues as biological agents, mainly regarding the therapeutics of neglected diseases. Out of the eight tested analogues, four of them showed activity against the promastigotes of L. amazonensis (Table 2), within the range of 20 to 60 μM. Compound 6 was the most active one (21 μM), exhibiting an IC50 value close to the one obtained with the standard drug of the assay, the Amphotericin B (16.23 μM). Compound 3 was the second best of the series, followed by Compounds 4 and 5, both presenting very similar antileishmanial behavior. However, no compound was better than the pentamidine standard drug (10.76 μM). Even though compounds that were more active against leishmaniasis have been reported in literature, our results are still encouraging because the antileishmanial activity was verified solely considering this scaffold. A suitable cytotoxic profile was obtained to compound 6 when considering the THP-1 cells, with a selectivity index of 2.20, but this index was lower when considering L929 cells (1.30). The THP-1 cell line is a frequent model for imitating the function and regulation of macrophages, the host cells of L. amazonensis. Similarly, Compounds 3, 4 and 5 exhibited selectivity indexes suitable to proceed to the next steps of the development, since the toxic dose was about two times higher than the effective dose, both when considering L929 and THP-1 cells. Moreover, no cytotoxic effect was observed against Vero cells at the same concentration range tested, except for compound 1, which had a SI of 0.74. This last compound was inactive against L. amazonensis, though. These observations encouraged us to proceed with further studies, aiming to understand which of the structural aspects could be related to the activity or cytotoxicity of the compounds. CLogP values ranging from 3.5 to 4.5 seem to be ideal to the biological activity of the series observed. Moreover, molar refractivity (MR) also presented a good correlation with antileishmanial activity (Additional file 2), indicating that not just the lipophilicity contributes to the antileishmanial activity, but also molar volume and polarizability. The observed relations with hydrophobic, volume, and polarizability parameters strongly suggest the importance of membrane permeation to the activity of these scaffolds. Such findings are also in accordance with the observations of Papadopoulou et al., in which linear correlation coefficients of 0.979 and 0.977 were found between the antitrypanosomal activity and the CLogP values of their piperazine and non-piperazine derivatives . Their results against L. donovani are significant and have also demonstrated good correlation with the lipophilicity of their analogues (r2 = 0.886). These compounds, however, presented cytotoxicity toward L6 cells, which were also related to the lipophilicity. Aiming to explain the differential cytotoxic profile observed among the eukaryotic cells, molecular modeling studies were also performed. Initially, a target fishing study was carried out to identify potential targets to the compounds. Most of the returned targets are related to nucleotide recognition, processing, transport, and/or metabolism. This could indicate structural similarity between the scaffold and these endogenous substrates. It also could explain, to some degree, the observed cytotoxicity toward some of the tested cell lines. The single common target to all tested compounds was the S-methyl-5-thioadenosine phosphorylase (1CG6, pdb entry). This enzyme catalyzes the conversion of 5′-deoxy-5′-methylthioadenosine in adenine and 5-methylthio-D-ribose-1-phosphate in a fundamental step of the polyamine biosynthesis . This pathway is essential to the production of nucleotides and, therefore, essential to cell growth and proliferation. Unfortunately, the phosphorylase isoform pointed out as a target to these compounds is the human one, and it would not be able to explain the antileishmanial action observed. However, this enzyme has its correspondent isoform in several living organisms. Investigation for potential Leishmania sp isoforms was performed with the BLAST. The search found nine protein sequences with identity values ranging from 37 to 38%, all from different Leishmania species, including one from the L. mexicana complex. The Expectation values (E-values) of 10− 54 obtained in this study corroborates with the significance of the alignment, since the lower the E-value, the more significant the alignment and its scores (Table 4). Most of the conserved residues are located at the binding site region, as revealed by the alignment of the putative L. mexicana phosphorylase and the human isoform (Fig. 2). The binding mode of 5′-deoxy-5′-methylthioadenosine on the human isoform is sustained by three main hydrogen-bound interactions with the Met196, Asp220 and Asp222. The alignment with the enzyme from L. mexicana showed that these residues are conserved at the binding site, corresponding to the Met200, Asp224 and Asp226. This similarity could be the basis for the cytotoxicity observed toward the L929 fibroblasts and THP-1 cells, but not toward the Vero cells, which is a S-methyl-5-thioadenosine phosphorylase negative cell line . 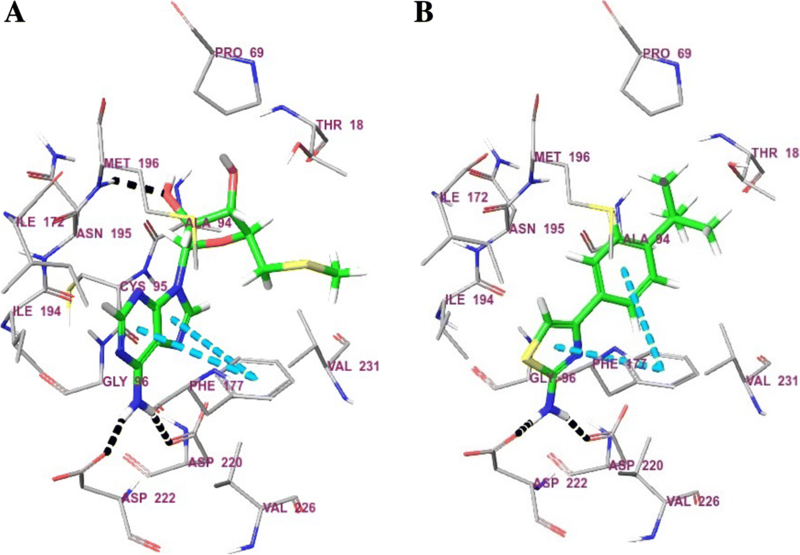 In the absence of crystallographic data from the L. mexicana enzyme, docking studies with the human isoform were performed to verify the potential binding mode of the 4-phenyl-2-aminothiazole to the phosphorylase (Fig. 1). The most prevalent pose of compound 6 at the phosphorylase binding site was found at 89% frequency. This pose showed values 43.34Goldscore and 18.93 Chemscore, which are compatible with the good fitness of compound 6 at the binding site. The docked compound 6 also showed good correspondence with the binding mode exhibited by the 5′-deoxy-5′-methylthioadenosine, the original ligand of the phosphorylase. The amino group of 4-phenyl-2-aminothiazole compound 6 (Fig. 1b) established hydrogen bonds, as a donor, with the Asp220 and Asp222 residues, just like observed for the co-crystallized ligand (Fig. 1a). Compound 6 also positioned its aromatic systems suitably to establish pi-stacking interactions with Phe117, which, once more, mimics the 5′-deoxy-5′-methylthioadenosine binding mode. The tert-butyl group from the 4-phenyl ring was positioned close to a set of hydrophobic residues, Thr18, Pro69 and Val231, occupying the same site of the methylthio moiety from the co-crystallized ligand. Conversely, no interaction between compound 6 and Met196 was observed. Compounds 3, 4 and 5 were also theoretically docked to the phosphorylase and exhibited the same pattern of interactions described above when regarding their most frequent poses, 96%, 94% and 100%, respectively (Additional file 5). Literature on S-methyl-5-thioadenosine phosphorylase expression in different cell lines reports that almost all non-neoplastic mammal cells express this enzyme [26–28]. Most of the S-methyl-5-thioadenosine phosphorylase lacking cells are malignant cells, as discussed by Kamatani et al. . Even though these studies were performed taking the human enzyme into consideration, the results could be used as a guide to future design new antileishmanial compounds. For instance, homology modeling studies can be useful in order to improve such studies. Derivatives of 2-aminothiazoles have been reported as predominantly active against trypanosomes, such as in the case of Kaiser et al., but they have not shown expressive activity against leishmanias. Nearly all literature reports are based on studies with L. donovani or L. infantum, both responsible for the visceral leishmaniasis, since this is the lethal form of the disease . Unfortunately, cutaneous leishmaniasis is thought to be less dangerous, and because of it, it is believed to potentially lead to a spontaneous cure. Several cases, however, evolve to the mucocutaneous form of the diseases, just like observed in infections caused by the L. braziliensis. This clinical manifestation is characterized by deforming lesions that often compromise the patient’s social life. Moreover, leishmania species from the L. mexicana complex are widely known to be resistant to treatment, mainly those based on in situ free-radical production, as is the case of nitroderivatives. Such mechanism of action implies low selectivity and, consequently, a broad panel of side effects. Ironically, several of the promising new compounds explored against trypanosomatidae parasites are nitroaromatic compounds [30, 31]. Finding compounds that are active against such parasites with IC50 values lower than 10 μM and with good toxicological profile is still a challenging task. From this point of view, the 4-phenyl-2-aminothiazole scaffold arises as a non-nitroaromatic alternative to the development of new antileishmanial drugs. Considering the results herein reported, the 4-phenyl-2-aminothiazoles might be potential scaffolds to be explored in the search for new antileishmanial hits. Four out of the eight tested compounds exhibited important anti-promastigote activity associated with good selectivity indexes, except in the cases of compounds 1 and 6 (in the latter, only when considering its activity against L929 cells). This is the first report of their effectiveness against the L. amazonensis, one of the species of leishmania responsible for the cutaneous form of the disease. Currently, studies using the most promising compounds have been conducted to evaluate their effects on the amastigote form of the parasite, which is found in the mammalian host. Such tests are important and fundamental for a better evaluation of the applicability of the compounds for the treatment of leishmaniasis. The 4-phenyl-2-aminothiazole scaffold arises, as discussed, as a non-nitroaromatic alternative to the development of new antileishmanial drugs. As scaffolds, these structures could be rationally modified to present selectivity along with improved antileishmanial activity, since the differences between the binding sites of the human and leishmania phosphorylases can be explored. The authors are grateful to FAPESP for the financial support (FAPESP 2013/01875-0), and to CAPES and CNPq for the grants. The authors would like to thank the São Paulo Research Foundation (FAPESP) for the financial support (FAPESP 2013/01875–0) and for the software licenses, when applicable; and the Coordination for the Improvement of Higher Education Personnel (CAPES) and the National Council for Scientific and Technological Development (CNPq) for the grants of MOLC and PFS (PIBIC). The publication of this work was also partially supported by the Coordination for the Improvement of Higher Education Personnel (CAPES) through Programa Editoração CAPES (edital n. 13/2016, auxílio n. 0722/2017, processo n. 88881.142062/2017–01) and by the National Council for Scientific and Technological Development (CNPq) through Programa Editorial CNPq/CAPES (chamada n. 26/2017, processo n. 440954/2017–7). The authors contributed equally to the final version of the manuscript. CAR, PFdS, MOLdC, and TFAP developed the synthetic, structural and activity relationships and molecular modeling studies under the supervision of Dr. DGGR. Dr. PX and MMG were in charge of both the antileishmanial assays and the cytotoxicity assay against THP-1 and L929 cell lines. Dr. JdM and AM developed the cytotoxicity assays on Vero cells. All authors read and approved the final manuscript. World Health Organization – Leishmaniasis. http://www.who.int/leishmaniasis/en/. Accessed 24 Jan 2016. MarvinSketch (version 6.2.2), calculation module developed by ChemAxon. 2014. http://www.chemaxon.com/products/marvin/marvinsketch/.